Tuscany offers a dolce vita mix of hearty cuisine, fascinating history, and gentle beauty. 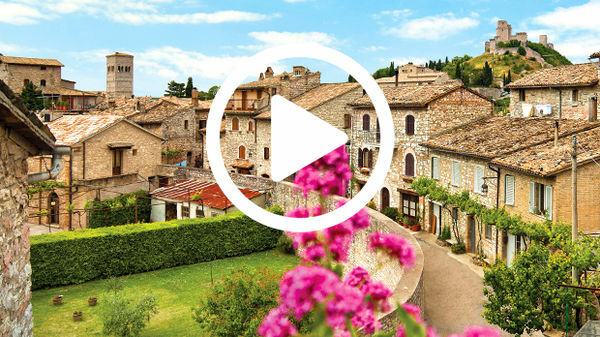 First we'll learn about the original Tuscans — the ancient Etruscans — at Volterra's Etruscan Museum, then we'll tour a hill town that was important to both the Etruscans and the Romans, head into the woods for a truffle hunt, eat slow food Italian-style during Sunday lunch in Chiusure, and finish in Montepulciano, where we'll get passionate about the local wine. Filled top to bottom with rare Etruscan artifacts, this museum — even with few English explanations and its dusty, old-school style — makes it easy to appreciate how advanced this pre-Roman culture was. American Annie Adair is an excellent guide for private, in-depth tours of Volterra. Her husband Francesco, an easy-going sommelier and wine critic, leads a "Wine Tasting 101" crash course in sampling Tuscan wines. For a more in-depth wine experience, Annie and Francesco offer excursions into the heart of Chianti and can even organize Tuscan weddings for Americans. Alab'Arte offers a fun peek into the art of alabaster. At their powdery workshop you can watch Roberto Chiti and Giorgio Finazzo at work, and they're delighted to share their art with visitors. (Everything — including Roberto and Giorgio — is covered in a fine white dust.) Lighting shows off the translucent quality of the stone and the expertise of these artists. This is not a touristy guided visit, but something far more special: the chance to see busy artisans practicing their craft. La Vena di Vino, just across from the Etruscan Museum, is a fun enoteca where two guys who have devoted themselves to the wonders of wine share it with a fun-loving passion. Each day Bruno and Lucio open six or eight bottles, serve your choice by the glass, pair it with characteristic munchies, and offer fine music (guitars available for patrons) and an unusual decor (the place is strewn with bras). Hang out here with the local characters. This is your chance to try the Super Tuscan wine — a creative mix of international grapes grown in Tuscany. According to Bruno, the Brunello is just right with wild boar, and the Super Tuscan is perfect for meditation. Although Volterra is famously quiet late at night, this place is full of action. Roberto runs all-day minibus tours with a passion for local culture, hands-on experiences, and offbeat sights. The price is reasonable, since he assembles groups of up to eight people to share the experience...and the cost. Roberto also arranges Siena city walks. Roberto's passions are Sienese culture, Tuscan history, and local cuisine. Montepulciano's most popular attraction isn't made of stone — it's the famous wine, Vino Nobile. This robust red can be tasted in any of the cantinas lining Via Ricci and Via di Gracciano nel Corso, but the cantina in the basement of Palazzo Contucci is both historic and fun. Skip the palace's formal wine-tasting showroom facing the square, and instead head down the lane on the right to the actual cellars, where you'll meet lively Adamo, who has been making wine here since 1961 and welcomes tourists into the cellar. While at the palace, you may meet Andrea or Ginevra Contucci, whose family has lived here since the 11th century. They love to share their family's products with the public. Adamo and the Contuccis usually have a half-dozen bottles open, and at busy times, other members of their staff are likely to speak English. Elegant Mueblè il Riccio ("The Hedgehog") offers 10 modern and spotless rooms, an awesome roof terrace, and friendly owners. Five are new "superior" rooms with grand views across the Tuscan valleys. I'm Rick Steves, and we're exploring more of the best of Europe. This time we're in Italy, and it's all about la dolce vita. It's "the sweet life" in Tuscany. Thanks for joining us. 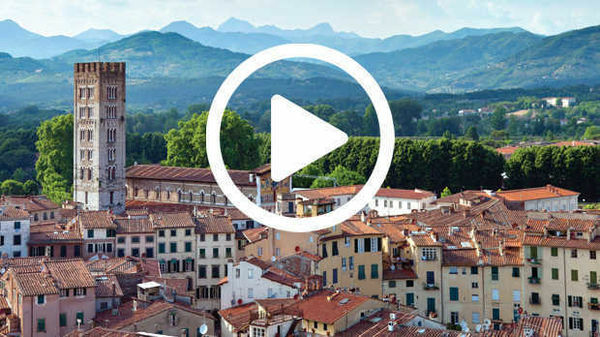 When travel dreams take people to Italy, Tuscany is often their first stop. There's something charming…almost seductively charming about this region and its rustic good living. 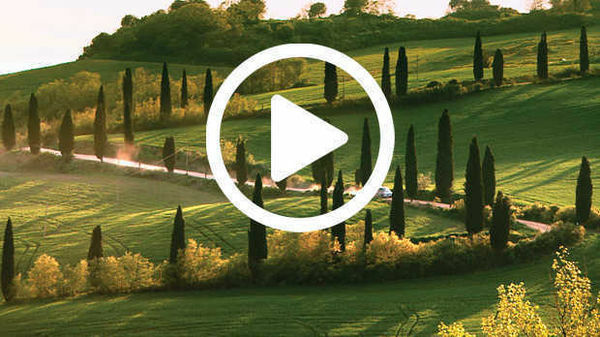 Tuscany offers a dolce vita mix of hearty cuisine, fascinating history, and gentle beauty. First, we'll learn about the original Tuscans — the ancient Etruscans. We'll tour a hill town that was important to both the Etruscans and the Romans, head into the woods for a truffle hunt, we'll eat "slow food" Italian-style during a Sunday lunch, and finish in another hill town, where we'll get passionate about the local wine. Italy is the size of California, and the region of Tuscany grabs the center. We'll visit Volterra before checking out Pienza and Montepulciano. Tuscany is named after the Etruscan people, who lived here centuries before this region was conquered by ancient Rome. Over 2,500 years ago, long before anybody had heard of Julius Caesar, and back when Rome was just a small town, the Etruscan civilization flourished in this part of Italy. Etruscan tombs are scattered all over the countryside — located both on good maps and on signposts. We're dropping in on a farm to visit the tomb of the Hescanas family. This tomb — cut out of solid tuff rock — was discovered by the farmer's grandfather. What little we know about the Etruscans we've learned mostly from their fresco-covered tombs. Farmer: É tre cinquanta avanti Cristo. The farmer tells me that this tomb dates back to about 350 BC. Farmer: Solo tufo; si, si. The entire family was buried in several sarcophagi in this tomb. We can read the family name…spelled [out] what we would call backwards…HESCANAS. The faint but still readable frescoes take us back to the funeral ritual. Signor Hescanas rides the chariot into the afterlife. It's a pre-Christian judgment day as a divine magistrate deliberates his case. A heavenly chamber orchestra provides music as women in fine gowns and jewelry dance. The motion and realism captured by the fourth-century B.C. artist is impressive. Looking at this evidence of such an advanced civilization it's amazing that these earliest Tuscans are still largely a mystery. With the rise of Rome, Etruscan civilization vanished — steamrolled and absorbed into that mighty empire. Now, with each tomb excavated, archeologists are piecing together the mysterious puzzle of Etruscan culture. Like many popular Tuscan towns, Volterra sits on an Etruscan foundation. Twenty-five hundred years ago, Volterra was one of the most important Etruscan cities. It was a key trading center protected by a four-mile-long wall. Its mighty Etruscan gate — built of massive tuff stones — survives. The three seriously eroded heads date from the second century B.C., and show what can happen when you leave something outside for 2,000 years. The smaller stones are part of the medieval city wall, which incorporated parts of the much older Etruscan wall. Unlike other famous towns in Tuscany, Volterra feels not cutesy and touristic…but real, vibrant, and almost oblivious to the allure of the tourist dollar. A refreshing break from its more commercial neighbors, it's my favorite small town in Tuscany. Volterra's Etruscan Museum is filled top to bottom with precious artifacts from centuries before Christ. The artifacts were mostly excavated from tombs. You'll see etched mirrors, stylized bronze buckles, intricately decorated pot handles, and exquisitely crafted jewelry. The exhibit helps us appreciate the sophistication of this pre-Roman society. The forte of this museum is its many finely carved funerary urns — stone boxes containing ashes of the dead. They suggest the Etruscans were influenced by their ancient Greek contemporaries. But while Greek artists focused on the idealized human form, the Etruscans represented people as unique individuals — portrayed realistically, with wrinkles, crooked noses, and funny haircuts. The museum's extensive collection of urns — with subjects lounging as if munching grapes with the gods at some heavenly banquet — is a reminder that the Etruscans believed you'd have fun in the afterlife. Volterra's 700-year-old city hall claims to be the oldest in Tuscany. Civic palaces like these were emblems of an era when city-states were strong. They were architectural exclamation points declaring that townspeople, rather than popes and emperors, were calling the shots. Towns like Volterra were truly city-states — they were fiercely independent and relatively democratic. They had their own armies, raised their own taxes, even had their own systems of weights and measures. A challenge for me in my guidebook writing is to take a slice of a town — like Volterra's main drag — and, with help from local guides, give travelers a peek into the culture. There's so much to see and learn…if you know where to look. Annie Adair — an American who fell in love with Volterra…and one of its men — works here as a guide, and she's joining us to help out. Annie: So, every Saturday morning when the town market is held, this little corner is where all the farmers meet to discuss, you know, how they're going to sell their wheat, what fertilizer they are going to use, or whatever they need. Rick: So, it's a tradition they gather right there? Rick: How are your fava beans doing? Rick: Oh, there you've got…? Annie: The king of the Tuscan forest: the wild boar. Annie: Which is made into great sausages and ham hocks. And this is its leg. Hairy on the outside, but prosciutto in the inside. Annie: …and they would have to build wooden additions and balconies hanging over the streets so it was a tangled mess of balconies and roofs. Rick: So these little nubs supported wooden…add-ons, basically? Rick: Now, that's one stout tower. Annie: It was actually the house tower, or the home of a noble family in the 13th century. Rick: So, it was a private home. Annie: It was a private home, but it also served a defensive function. You see on the ground floor. This would have been where they would've had a store, but there was no interior staircase, so to get inside the house they'd have to use a ladder up to that door above, that's very narrow. Rick: So that's the front door of the house? Annie: That was the front door — to get inside the house — and it was made so narrow so that you couldn't possibly get inside wearing armor. It turns out that quaint little Volterra was a significant player in both ancient Etruscan and Roman times. Annie: By ancient standards, Volterra was huge. Under the Etruscans there were 25,000 inhabitants. Annie: And about five centuries later, under the Romans there were just as many people. And they built this theater down here to seat up to 2,000 spectators. Rick: So, under all of this, there's Roman ruin just like this? Annie: Just about anywhere you dig you can find something that's Roman. Alabaster has traditionally been a specialty here. Fine galleries show off the expertise of local artists. To see sculptors in action, drop by the powdery Alab'Arte workshop, where Roberto and Giorgio turn rock into art. Alabaster, quarried nearby, has long been a big industry here in Volterra. Alabaster is softer and easier to work than marble. Long appreciated for its translucent quality, it was sliced thin to provide windows for Italy's medieval churches. Just up the street, at La Vena di Vino wine bar, Bruno and Lucio devote themselves to the wonders of wine. They share their vino, and their love of music, with a fun-loving passion. Each day this wine-sipping duo open six or eight bottles of the best local wine and serve it to the local gang with a charismatic flair. This is your chance to compare two favorite Tuscan reds, Brunello di Montalcino and Super Tuscan, with the help of a good teacher. Bruno: The Montalcino is traditional wine in Tuscany. Is Sangiovese grapes, it's only Sangiovese grapes. Sangiovese grosso from Montalcino and traditional — aged five years. Rick: So, the Brunello is all Sangiovese? Rick: And explain to me the Super Tuscan. Bruno: Super Tuscan is Tuscan wine but with international grapes; cabernet, merlot, syrah. It's possible with Sangiovese grapes. Rick: It's open for creativity; a little Tuscan, a little French, Spanish. Who knows? Tuscan wines are some of the tastiest and most famous in Italy. Wines are particular to their village. The characteristics of the soil, temperature, and exposure to sun make each wine — even if made from the same Sangiovese grape — unique. To connect with the rural charm that's so much a part of our image of Tuscany, we're exploring by car and staying not in towns, but in farm houses…like the Agriturismo Terrapille. This relaxing hideaway crowns a bluff just below the hill town of Pienza. Surrounded by 360 degrees of dreamy Tuscan scenery, it's private and rustic, yet comfy and romantic. In the spring, the fertile Tuscan countryside becomes a green mosaic of farms. Many of these are agriturismos, offering good value accommodations to travelers. Some are luxurious, with plush rooms and offering amenities such as riding stables and swimming pools. Others are simple and rustic, offering casual farmhouse hospitality and the smell of whatever is being produced. A peaceful home base for exploring the region, these rural Italian B&Bs are family-friendly and ideal for those traveling by car. Agriturismos are subsidized — part of a government effort to help small, family-run farms survive in this age of large-scale corporate farming. To qualify as an agriturismo, a place must still be a working farm. If this sounds good to you, choose a place that advertises itself specifically as an agriturismo. When in Tuscany, I team up with my friend and fellow tour guide, Roberto Bechi. He always has some creative ways to get off the beaten path and closer to the culture…this time it's truffles. We're meeting Fabio and his prized dogs Nic and Susi to hunt the beloved truffles — one of this region's specialties. Rick: So basically, what are truffles? Roberto: Truffles are mushrooms that live underground. Rick: OK. And where do you find them? Roberto: You find them near the oak trees. Rick: So these dogs are onto something. Rick: What kind of environment do they like? Roberto: Well, they like a lot of moisture. Rick: Tell me about these dogs. Roberto: These dogs are trained for years before they can find the mushroom. Rick: They smell it out? The dogs are given two commands: "Dov'è" means "Where is it?" And "c'è," "is there one"? Rick: Did he find something? Roberto: It's called a vanghino. Roberto: It's to dig out the truffle…I see one! Rick: Oh there it is! Rick: So this is the precious truffle? Rick: And people pay a lot of money for this? Just down the road, the village of Chiusure is celebrating its annual artichoke festival. People from all around gather to celebrate the peak of the artichoke season. Young and old gather to prepare these bristly treats. Rick: Ah, they love their artichokes here. Rick: I can see why. It's tasty. Mmm! What is it about these artichokes? Roberto: Well, this community brought back this artichoke from extinction. Roberto: This particular species here. Rick: Wow. So they have a festival every year then, huh? Rick: Tell me about this "slow food." This is related to the slow-food movement, right? Roberto: Absolutely, it's the idea that you have to eat quality and not quantity. That you have to preserve the variety of foods. Roberto: No chemicals first, but also, the varieties. Roberto: More varieties — better. Rick: And eat in the season. Roberto: Absolutely, always eat in season. Rick: Wow, I'll be back next year for the artichoke festival. It's great. And food just doesn't get much slower than cheese making. In the nearby hills, a flock of free-range sheep, and a few noble goats, head back to munch spring grass after being milked. Victoria, with a little help, hauls their fresh milk into her cheese workshop. She starts by pouring the milk into a big kettle to warm. When it gets to the right temperature she mixes in a thistle-flower solution, instead of rennet, to get it to curdle. Then, when it reaches the right consistency, she stirs it, and separates the curds and whey (or liquid). She presses the curds into forms made of beechwood, gently squeezing the moisture out. Afterwards, Victoria lovingly tends her aging rounds of cheese. Farms like this are part of Italy's growing Slow Food movement, where producers maintain the labor-intensive traditions, and consumers are willing to pay extra for the quality. Meanwhile, back at the agriturismo, the cattle — oblivious to their fate — are raised in free-range bliss. These Chianina cows are celebrated throughout Tuscany for their lean and tasty beef. It's Sunday, and Roberto's Slow Food group is enjoying a convivial lunch on the farm. Our meal couldn't be more fresh — local wine, Victoria's cheese, today's crunchy bread. We're grating some of those exquisitely pungent truffles on our pasta. The artichokes are gobbled down raw by young and old — a leafy delicacy. And our Florentine-cut steak is cooked just the way locals like it: rare — and sliced thin…good enough for a Medici prince. Lunch is the main event on this timeless Tuscan Sunday. Our next stop, Pienza, is a small town that packs a lot of Renaissance punch. In the 1400s, Pope Pius II of the Piccolomini family decided to remodel his hometown in a style that was all the rage: Renaissance. With construction fast-tracked by papal clout, the town was transformed in just four years from a medieval jumble to a jewel of Renaissance architecture. And the town that was named "Corsignano" was renamed "Pienza," after Pope Pius II. Pienza's classic main square is famous for its elegance and artistic unity: the city hall, two palaces, and the cathedral. With its bold Renaissance facade — the Piccolomini family coat of arms immodestly front and center — the church dominates the piazza. Pope Pius II's palace, which welcomes the public, remained the home of the Piccolomini family until 1962. Pienza, while plenty touristy, is a delight to explore. It doesn't take long to walk each lane in the tiny town. Views from the terrace include the Tuscan countryside, and somewhere in the distance, on another hilltop, stands Montepulciano. Crowning yet another ridge, Montepulciano welcomes visitors with views, villas, and vino. Streets are lined with noble palazzos because Florentine nobility favored Montepulciano as a breezy and relaxed place for a summer residence. Aristocratic egos meant each palace was built to outdo its neighbor. Piazza Grande is dominated by the city hall. It looks like the Palazzo Vecchio in Florence because it was built under Florentine dominance five centuries ago. The crenellations along the roof were never intended to hide soldiers, just to symbolize power. The unfinished Duomo glumly looks on, wishing the city hadn't run out of money for its facade. It's not uncommon to find churches that were built until they were functional on the inside, and then, for various reasons, the facades were left unfinished. This intentionally rough brick work patiently waits for its final marble veneer…which will likely never arrive. Also facing the main square is the Contucci Palace, where the Contucci family still lives, produces, and sells their wine. In their cantina they welcome visitors to appreciate their wine and how it's made. Since 1953, your wine tasting host and very passionate tour guide has been…Adamo. And you don't have to speak Italian to understand that Adamo believes they make excellent Nobile di Montepulciano right here. Adamo: Il Nobile viene invecchiato in queste botti di rovere — di rovere francese, rovere di slovonia, rovere italiano. Adamo explains their wine ages from two to four years in oak from France, Slovenia, and Italy — and that each wood has its own distinct characteristics. If he gets this excited about wood, I can hardly wait for the tasting. Adamo explains that this Nobile has only aged two of its required four years, and it's perfect. To go beyond perfection we'll try some from a bottle in their tasting room. With Adamo's passion and guidance, wine can be enjoyed by anybody visiting Montepulciano. We have an appropriately aristocratic guesthouse to call home in town — and thankfully, it's just around the corner. Mueble il Riccio comes with medieval elegance, comfy rooms — mine has a view — and an expansive and memorable breakfast room. The owner, Giorgio, is happy to help his guests with sightseeing tips. And even better, Giorgio's taking me for a spin in one of his classic Italian cars. Tuscany looks great with the top down. The many charms of this region reward the traveler with a fascinating insight into a land that makes living well a time-honored art. Life can be oh so sweet, especially here in Tuscany. And it doesn't hurt to have Giorgio for a driver. Thanks for joining us for a little dolce vita. I'm Rick Steves. Until next time, keep on traveling. Avanti, Georgio! Karel: This is Rick feigning relaxation. Rick: Come on, I've been relaxing for 45 seconds — have you guys got it yet? Rick: No, don't eat it!…He ate it! Give it back! Rick: Didn't understand a word he said.